Embattled pastor and self-proclaimed prophet Shepherd Bushiri on Wednesday broadcast a video to supporters in which he spoke of "immense orchestrated attacks" he had been subjected to over the past five weeks. These included protests, calls for him to leave the country, and "my wife being poisoned to within an inch of her life". He did not elaborate on when the incident happened. 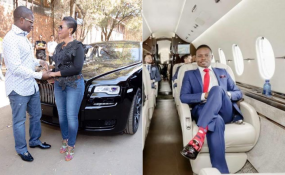 Bushiri's spokesperson Ephraim Nyondo told News24 on Thursday he did not have specific information regarding the alleged poisoning of Bushiri's wife, Mary. Bushiri, 35, and his wife were granted bail of R100 000 each in the Specialised Commercial Crimes Court in Pretoria on Wednesday. The couple was arrested by the Hawks last Friday and face charges of fraud, money laundering and contravening the Prevention of Organised Crime Act (POCA). They had been held in custody since. Bushiri heads the Enlightened Christian Gathering Church. "We have missed you and we know you have missed us as well," Bushiri said. He was reading his prepared message from a mobile device with an open Bible on the desk before him. The video was broadcast on the Prophetic Channel, as well as Bushiri's various social media platforms. The "prophet" thanked everyone who had "stood by me and my wife over the past five weeks". Bushiri said he could not go to sleep before addressing his congregants. "God has really been so faithful," Bushiri said. He then proceeded to thank those who "supported" him, including the South African presidency and the president of Malawi and the high commissioner, "who checked regularly" whether they were "in good spirits". Bushiri also said there were "many political parties" in South Africa "who always stood with us". ANC Tshwane chairperson Kgosi Maepa and Black First Land First (BLF) leader Andile Mngxitama have shown support for the couple. On Monday outside court, Mngxitama said: "As Black First Land First, we stand with the major one (Shepherd Bushiri). This is a systematic attack on the church and the prophet. "We are the only ones who have come out because we are on the side of the truth. We know that the major one is being prosecuted by this government because he is a black man who is successful out of his own effort and his blessings from his God," Mngxitama said. In his video address, Bushiri also thanked the media for their "support", referring specifically to the SABC, eNCA and News24, "who were always informing people fairly and accurately". Bushiri ended his broadcast with a Bible reading. Hawks spokesperson Hangwani Mulaudzi previously told News24 that the case against the couple was allegedly linked to offences of fraud and money laundering, as well as the contravention of POCA, which had allegedly been committed from 2015. The contravention of the act was in relation to Exchange Control Regulations, allegedly involving foreign currency of $1 147 200 (around R15m). City Press reported on Sunday that the Asset Forfeiture Unit (AFU) - a branch of the National Prosecuting Authority (NPA) - had joined the legal fight against the controversial couple and had filed a preservation order application, seeking to seize their assets, pending the finalisation of the criminal case against them. Two sources familiar with developments reportedly said the AFU had already filed an application in the Gauteng High Court in Pretoria, seeking its permission to seize the Bushiris' luxury houses and cars, as well as the self-styled prophet's Gulfstream private jet, which is parked in a private hangar at Lanseria Airport outside Johannesburg.